From a distance, the small trees seemed to be covered in gray flowers. Once up close, the “flowers” turned out to be curlicue seedpods covered in long silver hairs. The pods are striking, each tipped with a long curling tail like that on a squirrel or a frightened cat. This is desert mountain mahogany (Cercocarpus ledifolius), which grows in dry parts of California at 4,000+ feet in elevation. This small evergreen tree has oval, leathery leaves that are slightly hairy. I didn’t see it in bloom, but the flowers are described as unobtrusive–small and slightly hairy, with many stamens indicative of its membership in the Rosaceae family. 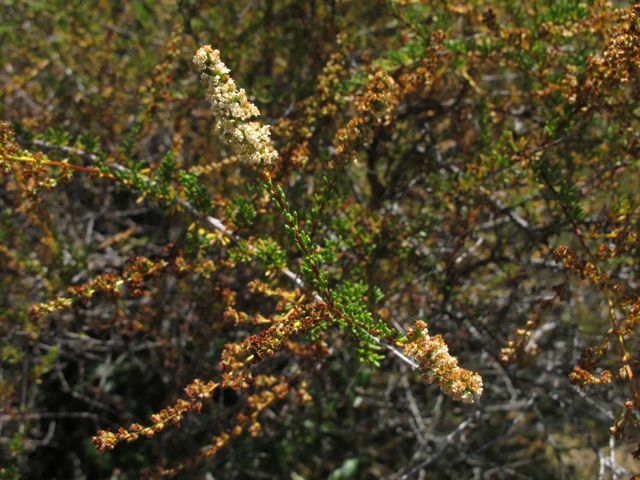 Mountain mahogany was used medicinally by Native American tribes such as the Paiute and the Shoshone to treat colds, burns, heart troubles and diarrhea. The inner bark was used as a red dye for buckskins Fish spears and bows were made from the wood, which is so hard and dense that it won’t float in water. Beautiful deep-blue flowers top tufts of green on an alpine slope. The vase-shaped blossom spreads into five gracefully rounded petals at the mouth; each petal is dotted with pale yellow spots that fade into green deeper in the throat of the flower. 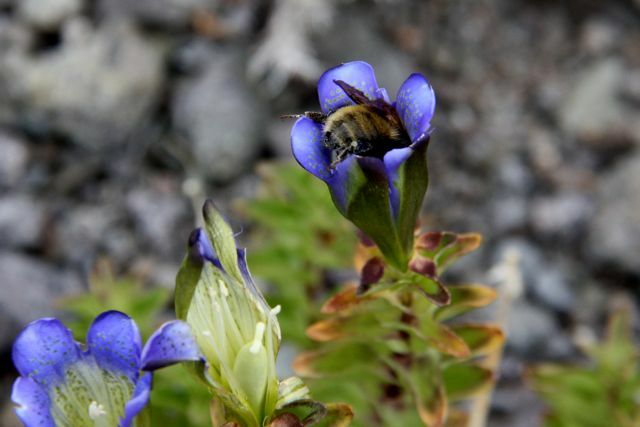 This is explorer’s gentian, or Gentiana calycosa, another high-elevation beauty (also called the Ranier gentian, or the Ranier pleated gentian). It likes cold climates and wet soil near streams or in low meadows (although I saw it outside this typical range, growing on an exposed and rocky slope, so this can happen as well). Bees and other insects love to rummage in it’s deep flowers, and it has been cultivated as an ornamental. 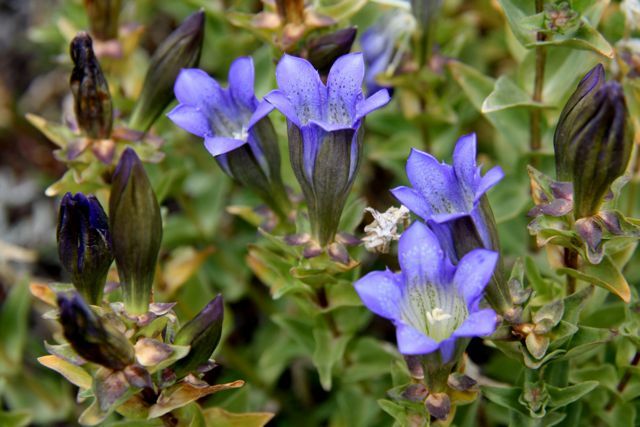 In the Bay Area, you can keep your eye out for the similar-looking pleated gentian (Gentiana affinis), a cousin that prefers low elevation. Flamboyant white flowers are scattered across a sagebrush plain. 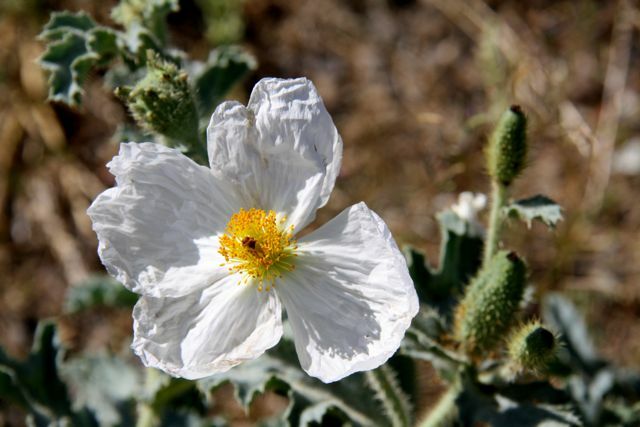 Prickly poppy, or Argemone munita, has the large papery-thin petals–stark white around a brilliant yellow center. Insects flock and feed among the many yellow stamens. The whole plant has abundant gray-green leaves that are prickly to the touch, and stands as tall as my knee. It is truly a beauty! But you won’t see it in the Bay Area; it grows across the west but only between 4,000 and 8,500 feet. 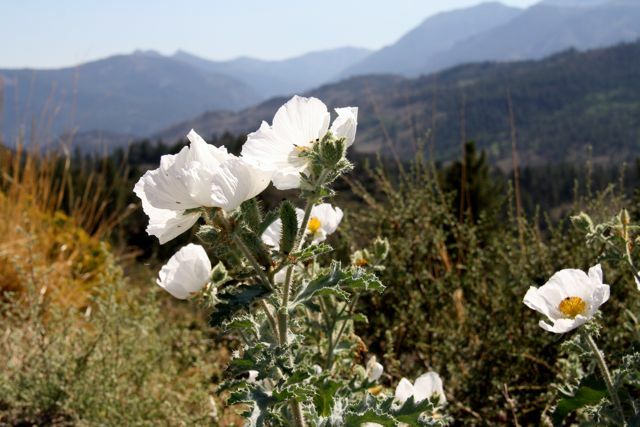 If you see a similar flower at low elevation, you’re probably looking at one of this bloom’s lovely cousins, such as the Matilja poppy. In the next few posts, I’ll be writing about some of the spectacular plants of the High Sierra (as I spent several days roaming the stretch of Highway 4 between Lake Alpine and Markleeville last week). It’s a beautiful and varied landscape, cresting at Ebbett’s Pass at over 8,700 feet. There are granite slopes, windswept cliffs, pine forests, sagebrush deserts and wet meadows. And the plants are varied as well, from the lush blooms of the desert to the tiny beauties of the meadows. And, of course, everything in between. Some of the flowers grow here in the lowlands as well (such as the water buttercup and speedwell I wrote about earlier this week) but they bloom later at high altitudes. Others look similar to our local varieties, but are different species. And some don’t look like anything around here at all! A pungent odor wafts across the flower-filled summer meadow. The smell is coming from the abundant yellow daisy-like flowers that are scattered everywhere. This is hayfield tarweed, or Hemizonia congesta. They look pretty, with three-lobed ray flowers encircling a soft yellow center. But if you pick one up you’ll get a sticky souvenir: this plant is incredibly resinous, and the smell and the stickiness will follow you until you can scrub off. Low-slung dogs will come back from hikes needing a bath, and the fragrance (strong but not unpleasant) lingers on fur and clothes. A little spring-fed stream is densely filled with the abundant deep green leaves of a low-growing plant. Petite blue-purple flowers bloom here and there in the foliage. This is American speedwell, or Veronica americana. A splayed pair of stamens surrounded by four small petals (the bottom one sometimes slightly smaller than the other three) are characteristic of the many species of speedwells. American speedwell (also called brooklime) is native to temperate parts of North America and Asia. This plant loves to grow in slow-moving water, where its fleshy stems grow into a sprawling tangle. It is tart but edible, and high in Vitamin C.
Petite cream-colored flowers peek above the still surface of a pond. Small white petals are banded with yellow at the center, surrounding a buttery cluster of yellow stamens. The flower has a glossy shine, akin to that of its land-locked buttercup cousins. Look close and you’ll see the flowers are rising from a mat of yellowish-green leaves just below the surface. Water buttercup (Ranunculus aquatilis) is also called whitewater crowfoot, likely because the narrow twiggy leaves look like the bony feet of a bird. You can see this plant all over California and throughout much of the west. The photos shown here were taken in the high Sierra, where a spring had made a small pond in an otherwise very dry landscape of sagebrush and juniper; the seeds must have been deposited by a bird that stopped there for water. 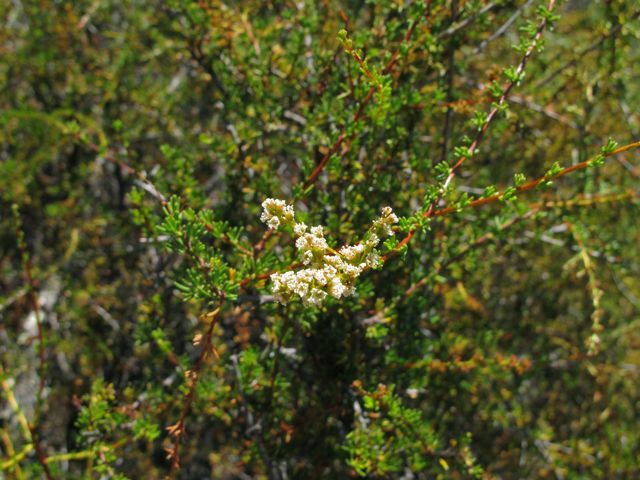 Chamise is a needle-leaved shrub of the chaparral. Right now it’s spikes of small white flowers are fading to brown, but the dried flowers will stay on the bush for most of the summer. A close look at those that are still blooming will show five little petals and the long splayed stamens. The flowers are so small that even when a bush is in full bloom it looks understated, not showy. The small, leathery leaves of chamise (Adenostoma fasciculatum) are about a quarter of an inch long and grow in bunches off the stem. This is one of the most common chaparral plants, and its leaves secretes an oil that burns easily. Native tribes used the oil to treat skin infections (they also used an infusion of bark and leaves to treat syphilis, and collected scale insects from the plant to make a glue for arrows and baskets).